A recent research project found that low-cost advising techniques can help disadvantaged students increase the number and selectivity of colleges they apply to. "Find the Fit," as the initiative is called, is intended to address the continuing problem of "undermatch," in which students don't go to college at all or choose a college that's less selective than their academic credits warrant. The problem is more acute among those students from lower socioeconomic backgrounds, who face headwinds such as affordability, application logistics and personal feelings of "falling short." Find the Fit uses a low-cost combination of activities to counter undermatch. For students, there are personalized planning materials that include information tailored to their likely college opportunities, as well as text or e-mail messaging customized for the schools where they're applying. For advisers, there are training webinars. The work took place within 194 U.S. Department of Education Upward Bound projects, which serve nearly 4,500 high school seniors. 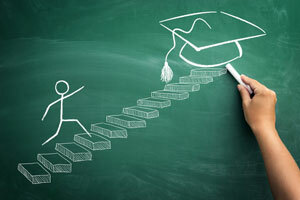 Upward Bound was designed to help high schoolers from economically poor backgrounds prepare to enroll in and complete college; while it reports high rates of college attendance among its project participants, these students — like many low-income students — may "miss opportunities to enroll in more selective or higher quality colleges," according to a report assessing the outcomes of the project. Half of the Upward Bound projects integrated Find the Fit into their regular services for their "rising" 2015-2016 seniors. This was the "treatment" group. The other half continued offering their usual Upward Bound services without Find the Fit, making up the "control" group. Both groups are being tracked over time so the outcomes can be compared to understand the full impact of Find the Fit. The new report is the first of three that will be produced from the study, which lasts six years. It focused on early indicators of college attendance, such as the behaviors and considerations before college enrollment that would be assumed to affect undermatching. It also examined how Upward Bound projects implemented the Find the Fit mechanisms. Find the Fit increased the share of students who applied to four or more colleges. Overall, the report stated, students in treatment group projects were nine percentage points more likely to say that they applied to four or more colleges than students in the control group (53 percent vs. 44 percent). The Find the Fit efforts pushed students to apply to more selective colleges: not just the "safety schools," but also schools that would be a good match or "even a 'reach'" for them given their academic history. Forty-eight percent of treatment group students applied to colleges rated at least "very competitive" vs. 38 percent of control group students. The Find the Fit efforts made no impact on the importance students placed on academic quality in choosing a college. The students in the treatment group were no more likely to rate academic quality as "very important" in choosing a college than students in the control group (for both groups it was about 75 percent). There was also no recognizable impact on the overall share of students completing the Free Application for Federal Student Aid (FAFSA) by March 15 of their senior year (65 percent vs. 61 percent). However, Find the Fit may have increased completion rates among student subgroups underrepresented in college — those who were Black or had low college entrance exams — by 8 to 10 percent. Find the Fit prompted students to complete the FAFSA by a date when both federal and many state and individual colleges' aid is still available. For the next report, researchers will look into how well these "interim outcomes" influence improved college outcomes. The full report is available from the National Center for Education Evaluation and Regional Assistance, a division of the federal Institute of Education Sciences.